Tokyo Tower is a tourist favorite in Tokyo and home to Tokyo One Piece Tower. In this article we'll be showing you the restaurant and souvenir shops, and also how to get good deals on tickets. Tokyo Tower is a tourist favorite of Tokyo. In the tower there are many tourist-targeted facilities, such as their incredible observatory deck. One of the most popular of them all though is the anime One Piece theme park: Tokyo One Piece Tower. In this article we will be showing you the restaurant and souvenir shops, and also how to get good deals on tickets. At Tokyo One Piece Tower, there are two shops where you can find yourself some great souvenirs. The first is the Tongari Store, which is restricted to those with a ticket to One Piece Tower; this shop has many goods exclusive to Tokyo Tower. The second shop can be accessed without a ticket to the One Piece Tower. It's the Mugiwara Store Tokyo One Piece Tower. It is located on the first floor of Tokyo Tower Foot Town. Here you can find various One Piece goods. Along with the standard Tokyo Tower souvenirs, you shouldn't miss the Tokyo One Piece Tower-exclusive products either. One popular type of souvenirs available here is the Devil Fruit Gummy Series. They have reproduced the "flavor" of the Devil Fruits, and there are 3 very unpleasant tasting gummies inside. It's kind of like a game of Russian Roulette when you eat them. The Tokyo One Piece Tower-exclusive T-shirts and Luffy's straw hat are also popular products. You can also find candy and the One Piece manga, as well as stationary and other standard souvenirs. You might want to consider purchasing some to remember your trip by. *The menu is subject to change without notice. After enjoying some of the attractions, you're bound to be pretty hungry. When you are, you'll want to head toward Sanji's Oresama Restaurant for a feast. It is a buffet-style restaurant with an all-you-can-eat service for 70 minutes. It is located outside of the One Piece Tower, so visitors not entering the park itself can also eat here. This huge ham hock is called Luffy's Dream Giant Honey Grilled Meat. You can taste Luffy's favorite dish for yourself. "Usopp's Bagna Cauda" is made with vegetables harvested by the Straw Hat Pirates at Thousand Sunny. This dish can be enjoyed with a delicious cheese sauce that really makes the most of the vegetables. Children love it too, so this is a perfect way to get them to eat their vegetables. There are other dishes based on One Piece characters as well. The price is 2000 yen for adults (13 and older), 1500 yen for children (7-12), 1000 yen for younger children (4-6), and free for kids younger than 3 (all prices are without tax). There aren't that many buffet-restaurants out there this reasonable and fun! There are plenty of desserts and drinks as well. Children and adults alike can feast here! There is also "Franky's Cola Bar" and a cafe space which you can enter without a park passport, where you can take a short break. It should be noted that Sanji's Oresama Restaurant is very popular, making it hard to enter at times. You should make a reservation online beforehand from the official website. The signs throughout the facility are mainly in Japanese, but there is a translation service you can use with your phone so that non-Japanese speakers can enjoy the facility with no problem. By reading the QR code you will be able to choose a language and access information about the facility and numbered tickets for the live attraction and more. If you have any problems, just head over and ask one of the "islanders" in a red and white striped uniform. There are always some staff on hand that can speak English or Chinese. At the entrance, you can receive a guide map offered in 5 different languages (Japanese, English, Traditional Chinese, Simplified Chinese, Korean), as well as a FREE Wi-Fi pass card available for use in Tokyo One Piece Tower. Ask the staff for a guide map in your preferred language and the FREE Wi-Fi pass card when you buy your ticket. Tickets for the day are sold at the third floor One Piece Tower entrance. The prices are 3200 yen for adults (19 and older), 2700 yen for High School and Middle School students, 1600 yen for children. 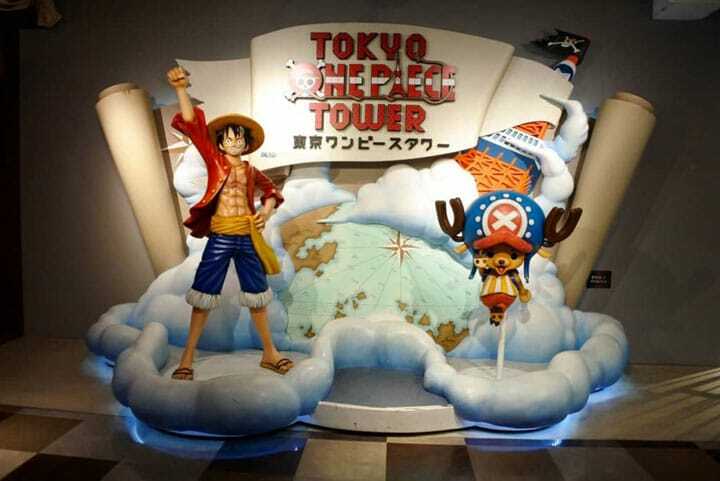 You can also purchase a set of tickets for the One Piece Tower combined with Tokyo Tower's Observation Deck. For people who want to enter the park smoothly, we recommend buying tickets in advance at places such as Seven-Eleven, or participating in a package tour by Ace JTB. These tickets can be purchased at a cheaper rate than buying them on the day of your visit. Check out the official website for more information. The tickets allow you to enjoy the park freely for a day. You can re-enter after eating somewhere outside as well. You can just leave the park from the designated gate after receiving a re-entry stamp and showing your passport ticket. How about experiencing the Straw Hat Pirates' adventures at the One Piece Tower? Meet Famous Japanese Characters At 5 Spots Near Tokyo!